It’s that time of year again where all the clinking glasses appear to have a deep pink hue whether in your favorite local restaurant or backyard BBQ. With International rosé Day coming up on June 10th, we realize there are a lot of ‘summer waters’ to choose from these days – everyone from actress Drew Barrymore to Hello Kitty has produced a bottle – so we have narrowed down some of our favorites and must haves for the dog days of rose-all-day imbibing ahead. With the seemingly endless parade of rosé vintages coming into the marketplace, it can get confusing, but our friends at E. & J. Gallo Winery have created an educational program to help wine lovers find the perfect rosé for their taste buds, from a J Brut sparkling to a Barefoot Bubbly, With Rosé Your Way™, a personal rosé concierge is only a Facebook message away. Patina Restaurant Group founder and celebrated Chef Joachim Splichal announces the launch of two new rosé wines, the 2017 Domaine de Cala Rosé and 2017 Domaine de Cala Prestige Rosé, from his family-owned and operated winery. Both wines hail from the French vineyards between Nice and Aix-en-Provence, showcasing a pale pink hue with bright and clear reflections, evoking both floral and citrus notes that delicately progress into a spicy aroma. 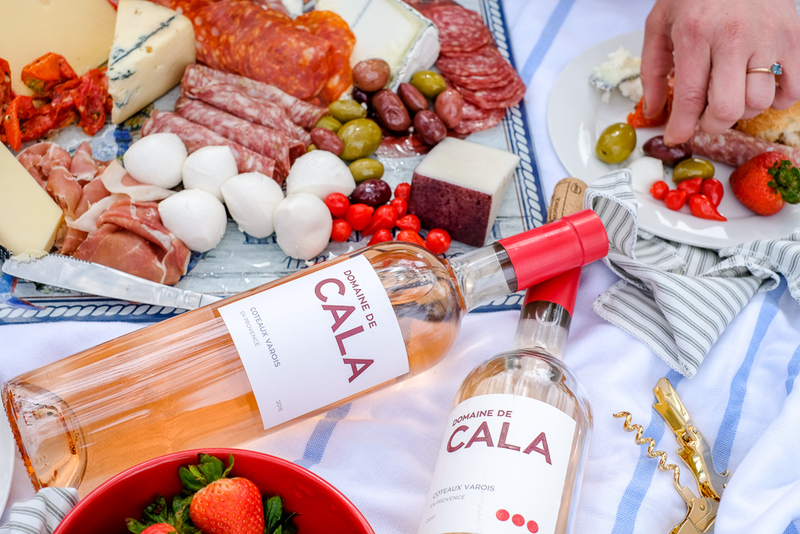 Very drinkable and well-priced at $15.95 for the classic Rosé and $25.95 for the Prestige Rosé, Domaine de Cala is available for purchase throughout the U.S., including all Whole Foods markets in Southern California. La Chapelle Gordonne, 2017 from Côtes de Provence ($24) won the number one coveted spot on VinePair.com for the best rose out of the top 25. Blending Grenache, Syrah and Cinsault varietals for a wine that pairs well with seafood, such as lobster, this bottle will be a perfect companion this summer to your clam bake or beach excursion. More scientific details: Clinging to the schist hillsides of Provence, the vineyard’s grapes are picked at night in order to take advantage of low temperatures, which enhances the quality. Some grapes are macerated before fermentation in order to facilitate the extraction of color and precursors of aromas. Under the press, the first juices selection allows only the tête de cuvée to be kept. Fermentation is controlled by strictly regulating temperatures, making it possible to work cold. Once the fermentation is completed, œnologists and cellar masters meet to decide how this vintage will be blended in accordance with strict color and organoleptic standards. Barrymore by Carmel Road Rosé of Pinot Noir 2017 ($18) Yes, this wine is by actress Drew Barrymore – of the entertainment dynasty – who is now a partner in a winery along with winemaker Chris Kato, and it’s quickly becoming one of our favorites on the market. On the palate, the wine is delicate with floral and light citrus aromas. Flavors of fresh red fruits, along with notes of peach and apricot intertwine with bright, mouthwatering acidity, leading to a crisp and vibrant finish. This wine pairs well with burgers, sushi and spicy dishes, and with the screw cap, should be a hit at outdoor events. Cape Mentelle Rose 2016 ($16.99) We love all wines from the Margaret River region of Western Australia, known as much for scenic surf as vintages, and this fresh, vibrant expression of the traditional dry rosé style is no exception. A combination of direct pressing and saignee methods deliver delicate, fresh aromas and color and your palate will swear it’s pricier than an under $20 bottle. Finally, celebrate your love for all things pink in a glass at the debut of Rosé Day LA at Saddlerock Ranch in Malibu on June 9th.